Away from the main roads, in the middle of nowhere, the "colline des ocres" is a Provençal vacation village. Comfortably installed in a maisonnette of Provence or a last generation mobilhome, you will be accommodated for your holidays, your week-ends and mid-week during all the year. "La Colline des Ocres" is a vacation village to human size. Are also at your disposal : swimming pool, ground of volleyball, badminton, table tennis, games and gaming room for children, phone, library and WIFI access. In July / August : service of bread, refreshments and ices, animations (Provençal and magic evenings, rando-ballad, picnic, creative workshops...). Thirteen "maisonnettes" and ten mobilhomes arranged on six hectares decorated with hundred-years-old oaks, with a big swimming pool (20m x 12m) are for you the best guarantee of serenity and peace. Our maisonnettes are equipped with an individual central heating. Show of garden, privative ground and site of individual carpark supplement these services. and a water room with separate toilets. From your terrace with summerhouse, you will be able to rest in any peace of mind and to appreciate sweet flavors which surround you. 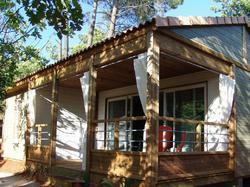 True small houses for your holidays. They are also equipped with terraces with hood.